In the 2008 election both major parties nominated candidates whose eligibility is dubious. For Barack Obama the question was whether he was born in Hawaii, which is U.S. soil. For John McCain the question was whether the Panama Canal Zone, where he was born, was U.S. soil. It is not, and being born of parents both of whom were U.S. citizens did not make him a "natural-born" citizen, although a statute was later adopted naturalizing such persons at birth. ... the prince is always under a constant tie to protect his natural-born subjects, at all times and in all countries, for this reason their allegiance due to him is equally universal and permanent. But, on the other hand, as the prince affords his protection to an alien, only during his residence in this realm, the allegiance of an alien is confined (in point of time) to the duration of such his residence, and (in point of locality) to the dominions of the British empire. Persons naturalized according to these acts, are entitled to all the rights of natural born citizens, except, first, that they cannot be elected as representatives in congress until seven years, thereafter. Secondly, nor can they be elected senators of the United States, until nine years thereafter. Thirdly, they are forever incapable of being chosen to the office of president of the United States. Persons naturalized before the adoption of the constitution, it is presumed, have all the capacities of natural born citizens. See C. U. S. Art. 1, 2. A citizen is a kind of subject, who is "subject" to a sovereign, but a citizen is also subject to a sovereign, which in a republic is the people, in their capacity as ratifiers, directly or indirectly, of the constitution, which replaces a monarch. [A foreign national]... so long as he was within the King's protection; which [though] but momentary and uncertain, is yet strong enough to make a [natural bond] he hath issue here, that issue is a natural born subject; ... There be regularly ... three incidents to a subject born. 1. That the parents be under the actual obedience of the King. 2. That the place of his birth be within the King's dominion. And, 3. The time of his birth is chiefly to be considered; for he cannot be a subject born of one kingdom that was born under the ligeance of a King of another kingdom, albeit afterwards one kingdom descend to the King of the other. ... many times ligeance or obedience without any place within the King's dominions may make a subject born, but any place within the King's dominions may make a subject born, but any place within the King's dominions without obedience can never produce a natural subject. And therefore if any of the King's ambassadors in foreign nations, have children there of their wives, being English women, by the common laws of England they are natural-born subjects, and yet they are born out-of the King's dominions. But if enemies should come into any of the King's dominions, and surprise any castle or fort, and possess the same by hostility, and have issue there, that issue is no subject to the King, though he be born within his dominions, for that he was not born under the King's ligeance or obedience. But the time of his birth is of the essence of a subject born; for he cannot be a subject to the King of England, unless at the time of his birth he was under the ligeance and obedience of the King. It may be questioned whether it is necessary to go back to 1608 to get the controlling law on the meaning of "natural born citizen" or of "natural born", however, legal terms of art, once established generally do not change, even if they are not used for centuries. "Natural born" is a term from English common law. It actually goes back even further than 1608, which was about the time that court proceedings, which had been done in Latin, began to the be done in English. The term goes back to ancient Roman law, usually as natus naturalis, or some variant thereof. "Natural born" was just a translation from the Latin. It is an established maxim, that birth is a criterion of allegiance. Birth, however, derives its force sometimes from place, and sometimes from parentage; but, in general place is the most certain criterion; it is what applies in the United States. That was not on the point of presidential eligibility, but it does show which rule applies. One question on the qualifications of the president was among the last to be decided. On the twenty-second of August the committee of detail, fixing the requisite age of the president at thirty-five, on their own motion and for the first time required that the president should be a citizen of the United States, and should have been an inhabitant of them for twenty-one years. The idea then arose that no number of years could properly prepare a foreigner for the office of president; but as men of other lands had spilled their blood in the cause of the United States, and had assisted at every stage of the formation of their institutions, the committee of states who were charged with all unfinished business proposed, on the fourth of September, that 'no person except a natural-born citizen, or a citizen of the United States at the the of the adoption of this constitution, should be eligible to the office of president,' and for the foreign-born proposed a reduction of the requisite years of residence to fourteen. On the seventh of September, the modification, with the restriction as to the age of the president, was unanimously adopted. The questions centered on how persons became citizens, and how long they had been citizens, but the subject of parentage was never raised. The Naturalization Act of 1790 stated "children of citizens of the United States, that may be born beyond the sea, or out of the limits of the United States, shall be considered as natural-born citizens. ", but "considered as" does not change the definition of the term or the fact of the physical circumstances of birth, nor can conferring a privilege by statute change an eligibility requirement in the Constitution. The 1790 Act also provided that its terms only applied to the law then in effect, which was changed with the repeal of it in 1795. When this Act was reconsidered, Madison himself pointed out that Congress only had constitutional authority to naturalize aliens, not U.S. citizens, and reported a bill that amended the statute to eliminate the words “natural born" and simply state that “the children of citizens of the United States" born abroad “shall be considered as citizens." This indicates that Madison’s view was that children born abroad of U.S. citizens were naturally aliens, rather than natural born citizens, and thus could be naturalized by Congressional statute but should not be called “natural born." Congress adopted this amendment in the Naturalization Act of 1795. The 1790 Congress made a mistake, using sloppy language, which was corrected it in the next act on the subject. It is also irrelevant. It is a naturalization act, and a statute cannot change the meaning of a term in the Constitution. For that one has to go back to the usage of the term before 1787, and that means usage by Coke and Blackstone, especially Coke, in Calvin's Case. That case controls the meaning for the Founders, who regularly referred to those authors when they were unclear on legal terms of art. The early Congresses often made constitutional errors. Then as now they did not always think everything through. For that matter, the Framers made some mistakes in the Constitution, but we are stuck with those mistakes unless or until we amend it. That error was corrected by repeal. It should be noted they were on their own titles naturalization acts, not "natural born definition" acts. § 212. ... The natives, or natural-born citizens, are those born in the country, of parents who are citizens. § 214. ... there are states, as, for instance, England, where the single circumstance of being born in the country naturalizes the children of a foreigner. However, "naturalizes" is also not an exact translation, which in Anglo-American law has come to mean a statutory or administrative process, but which for Vattel meant "makes one a citizen", which could include natural circumstances. There is no proof that deliberations took place at the convention on the subject of the letter. While the Committee on Detail originally proposed that the President must be merely a citizen as well as a resident for 21 years, the Committee of Eleven changed "citizen" to "natural born citizen" without explanation. The Convention accepted the change without further debate. Sometimes miscited on this subject is the Supreme Court case, The Venus, 12 U.S. 8 Cranch 253 253 (1814), which commented in dictum on various views of citizenship and the rights of citizens in a case in which the issue was whether a ship or cargo belonging to a U.S. citizen may be seized as a prize if it was bound to a nation with which the U.S. was at war, even if the U.S. citizen did not know it was at the time, but the holding was not on the issue of what constitutes citizenship, much less natural born citizenship. Natives are all persons born within the jurisdiction and allegiance of the United States. This is the rule of the common law, without any regard or reference to the political condition or allegiance of their parents, with the exception of the children of ambassadors, who are in theory born within the allegiance of the foreign power they represent. The citizens of each state constituted the citizens of the United States when the Constitution was adopted. ... [He] who was subsequently born the citizen of a State, became at the moment of his birth a citizen of the United States. Therefore every person born within the United States, its territories or districts, whether the parents are citizens or aliens, is a natural born citizen in the sense of the Constitution, and entitled to all the rights and privileges appertaining to that capacity. .... Under our Constitution the question is settled by its express language, and when we are informed that ... no person is eligible to the office of President unless he is a natural born citizen, the principle that the place of birth creates the relative quality is established as to us. The first section of the second article of the Constitution uses the language, "a natural-born citizen." It thus assumes that citizenship may be acquired by birth. Undoubtedly, this language of the Constitution was used in reference to that principle of public law, well understood in this country at the time of the adoption of the Constitution, which referred citizenship to the place of birth. At the Declaration of Independence, and ever since, the received general doctrine has been in conformity with the common law that free persons born within either of the colonies were subjects of the King that by the Declaration of Independence, and the consequent acquisition of sovereignty by the several States, all such persons ceased to be subjects, and became citizens of the several States, except so far as some of them were disfranchised by the legislative power of the States, or availed themselves, seasonably, of the right to adhere to the British Crown in the civil contest, and thus to continue British subjects. Under our Constitution, a naturalized citizen stands on an equal footing with the native citizen in all respects save that of eligibility to the Presidency. There is no law of the United States under which his father or any other person can deprive him of his birthright. He can return to America at the age of twenty-one, and in due time, if the people elect, he can become President of the United States... [citing to Steinkauler's Case, which was an opinion given by Edwards Pierrepont, who was Attorney General for Ulysses S. Grant]. However, some who argue against Obama's eligibility bring up the issue of the citizenship of his parents, saying that even if he were natural born on U.S. soil, he would not be a citizen because he would not be "subject to the jurisdiction" of the United States, as provided in the Fourteenth Amendment. At the time of adoption of that amendment, that would have excluded the children of unassimilated indigenes (American Indians, or Amerinds), foreign diplomats, and foreign invaders, but not peaceable foreign visitors who enter legally, discussed in the opinion in Ankeny v. Governor, which although not a precedent, provides an excellent compilation of the arguments pertaining to this topic. Amerinds have since all been brought within the jurisdiction of the United States. There is no claim that either of Barack Obama's parents was a foreign diplomat or invader at the time of his birth. The phrase of art "subject to the jurisdiction" did not exclude any "citizen of a foreign nation", unless acting at the direction or instigation of that foreign nation, making one a state actor. Consent to enter by an immigration official makes the entrant "subject to the jurisdiction" of the United States. This was emphasized in the case of Diaz-Salazar v. I.N.S., 700 F.2d 1156, 1160 (7th Cir. 1983) (noting in its recitation of the facts that despite the fact father was not a citizen of the United States, he had children who were "natural-born citizens of the United States"), cert. denied 462 U.S. 1132, 103 S. Ct. 3112 (1983). However, those who enter without official consent are presumptively "invaders" for this purpose, and their children would not be natural-born citizens if the fact of unlawful entry can be established. Some mis-cite the opinion in Minor v. Happersett, but it only states, in dictum, that natural birth and U.S. citizen parentage would be sufficient to establish U.S. citizenship at birth, not that U.S. citizenship parentage was necessary for the child to be a U.S. citizen. Justice Swayne was on the Court that decided Minor v. Happersett; as was Justice Field, who in 1884 wrote the Circuit Court opinion In re Look Tin Sing 21 F. 905. Look Tin Sing claimed the right to enter the United States "as a natural born citizen of the United States." The Court ruled in his favor, and Justice Field referred to Sanford's opinion in Lynch v. Clarke, saying, "After an exhaustive examination of the law the Vice-Chancellor said that he entertained no doubt that every person born within the dominions and allegiance of the United States, whatever the situation of his parents, was a natural born citizen; and added, that this was the general understanding of the legal profession, and the universal impression of the public mind. In illustration of this general understanding he mentions the fact, that when at an election an inquiry is made whether the person offering to vote is a citizen or an alien, if he answers that he is a native of this country the answer is received as conclusive that he is a citizen; that no one inquires further; no one asks whether his parents were citizens or foreigners; it is enough that he was born here whatever was the status of his parents." Most of the confusion over the eligibility of John McCain seems to stem from the mistaken notion that "citizen at birth" has the same meaning as "natural born citizen". The meaning is not the same. A naturalization statute can make a person a citizen at birth, but that does not make him "natural born". These first two correspond to "natural born". The rest are all "naturalized by statute". The Code lumps both into the same section, which is not uncommon. Don't look to the U.S. Code for subtle distinctions. It is not, in general, the law. It is evidence of the law. The Code is derived from the statutes by an office in the House of Representatives, the Office of the Law Revision Counsel, established for that purpose. They don't include all the statutes, and don't always get it right. (a)(23) The term ''naturalization'' means the conferring of nationality [NOT "citizenship" or "U.S. citizenship", but "nationality", which means "U.S. national"] of a state upon a person after birth, by any means whatsoever. The qualifier "after birth" doesn't mean by an official act done after birth. It means from the moment of birth, or in other words, not before birth. A fetus is not naturalized by statute. Most statutes conferring nationality/citizenship at birth were passed before most of the individuals to whom they apply were born. Some, however, were retroactive. An example of that was the statute that made McCain a U.S. citizen at birth, passed after his birth. But that is naturalization, not natural birth. Apart from the passing reference to the "natural born Citizen" in the Constitution's Art. II, 1, cl. 5, we have, in the Civil Rights Act of April 9,1866, 14 Stat. 27, the first statutory recognition and concomitant formal definition of the citizenship status of the native born: "[A]ll persons born in the United States and not subject to any foreign power, excluding Indians not taxed, are hereby declared to be citizens of the United States . . .This, of course, found immediate expression in the Fourteenth Amendment, adopted in 1868, with expansion to "[a]ll persons born or naturalized in the United States . . . .Thus, at long last, there emerged an express constitutional definition of citizenship. But it was one restricted to the combination of three factors, each and all significant: birth in the United States, naturalization in the United States, and subjection to the jurisdiction of the United States. The definition obviously did not apply to any acquisition of citizenship by being born abroad of an American parent. That type, and any other not covered by the Fourteenth Amendment, was necessarily left to proper congressional action. "The Fourteenth Amendment of the Constitution . . . contemplates two sources of citizenship, and two only: birth and naturalization. Citizenship by naturalization can only be acquired by naturalization under the authority and in the forms of law. But citizenship by birth is established by the mere fact of birth under the circumstances defined in the Constitution. Every person born in the United States, and subject to the jurisdiction thereof becomes at once a citizen of the United States, and needs no naturalization. A person born out of the jurisdiction of the United States can only become a citizen by being naturalized, either by treaty, as in the case of the annexation of foreign territory; or by authority of Congress, exercised either by declaring certain classes of persons to be citizens, as in the enactments conferring citizenship upon foreign-born children of citizens, or by enabling foreigners individually to become citizens by proceedings in the judicial tribunals, as in the ordinary provisions of the naturalization acts." One might think that while all citizens at birth may not be natural born citizens, all natural born citizens are also citizens at birth. However, it is possible for someone to be natural born without being a citizen at birth, or even being a citizen. Being a child of foreign diplomats or invaders is one way, but it is also possible that someone might be natural born on territory not incorporated into the United States at the time. For example, natural born citizens of Puerto Rico are not natural born citizens of the United States, eligible to be president, while it remains a protectorate or dependency. Neither are citizens of the territories of the Marianas (Guam and the Northern Mariana Islands) or the U.S. Virgin Islands" These are not U.S. soil. They are protectorates. We administer them but don't own them. No one born on them is a natural born citizen. There are naturalization statutes that makes persons born there citizens at birth. See Insular Cases . If Puerto Rico were admitted as a state, its natural born citizens would then become natural born citizens of the United States, eligible to be president, if otherwise qualified. If it later seceded (with the consent of Congress) its natural born citizens would cease to be natural born citizens of the U.S.
Natural born citizenship could also be lost by someone who was natural born on a territory initially claimed by the United States as part of its incorporated territory, but later ceded to the other nation that claims it. The boundary between the U.S. and Mexico was adjusted as the result of shifts in the path of the Rio Grande River, ceding some territory to Mexico that had some people living on it, who were given a choice whether to become U.S. citizens. There are also some disputed territories between the U.S. and Canada, although there may not be any people born or living on them. Other territories disputed between the U.S. and some other nation are not considered incorporated by the United States, but protectorates or dependencies. There is nothing about the concept of "naturalization" that requires some "process", other than the enactment of a declaratory statute. A statute can make a person a citizen at birth of territory that does not include the location where one is born. That is the naturalization process. But it is not "natural birth", which depends only on the location of birth on a particular spot on the Earth. Whatever anyone might later want to call that spot or the territory surrounding it, the child is natural born to that spot. He is not naturalized to that spot. He may be naturalized to another spot, or territory that does not include that spot. That is a change of status, and it is called "naturalization". The concept of citizenship is derived from denizenship, which requires a spot but not a government. There is a long tradition which holds that being born on the soil, while being necessary to being a "natural born citizen" was not sufficient. This requirement seems to be an attempt to go beyond the requirements of Calvin's Case that the parents must not be foreign invaders or diplomats, but may be denizens, such as unassimilated indigenes, which the Indians were considered to be through most of their history. This allowed for the children of legal foreign visitors to be deemed natural born citizens. The burden of proof is on the claimant to office. The presumption must be ineligibility unless it is proved otherwise. That direction of presumption is not, by the way, the same as for citizenship for individuals already on U.S. soil, for whom the burden is on someone seeking to deport them. On the other hand, one seeking to vote, or to re-enter the U.S. from outside, has the burden to prove citizenship, although it has historically been sufficient to do this by a notary who knows the individual. There is no constitutional authority to require anyone to present any particular form of identification, especially one issued by the government, that one is not constitutionally required to have, and there is no constitutional authority to require anyone to even have a name, much less any particular form of identification. Names are applied to us by other people. No one owns his name. All anyone can say is that "some people call me xyz". But other people can call anyone anything they please. That includes government authorities. And there is no authority to require anyone to know or say what other people call him. Not that government actors don't try anyway. [A]ll children, born out of the king's ligeance, whose fathers were natural-born subjects, are now natural born subjects themselves, to all intents and purposes, without any exception; unless their said fathers were attainted, or banished beyond sea, for high treason; or were then in the service of a prince at enmity with Great Britain. The qualifier "to all intents and purposes" is important, because to confer by statute rights and privileges of a status is not the same as redefining that status. A statute could confer the privileges of a man on a woman but that would not make her a man, or redefine "man" or "woman". And this maxim of the law proceeded upon a general principle, that every man owes natural allegiance where he is born, and cannot owe two such allegiances, or serve two masters, at once. Yet the children of the king's embassadors born abroad were always held to be natural subjects: z for as the father, though in a foreign country, owes not even a local allegiance to the prince to whom he is sent: so with regard to the son also, he was held (by a kind of postliminium) to be born under the king of England's allegiance, represented by his father, the embassador. To encourage also foreign commerce, it was enacted by statute 25 Edw. III. st. 2, that all children born abroad, provided both their parents were at the time of his birth in allegiance to the king, and the mother had passed the seas by her husband's consent, might inherit as if born in England: and accordingly it hath been so adjudged in behalf of merchants.a But by several more modern statutes b these restrictions are still farther taken off: so that all children, born out of the king's leigance, whose fathers (or grandfathers by the father's side) were natural-born subjects, are now deemed to be natural-born subjects themselves, to all intents and purposes; unless their said ancestors were attainted, or banished beyond sea, for high treason; or were at the birth of such children in the service of a prince at enmity with Great Britain .... .
With this expanded context we can see that Blackstone was discussing the offspring of ambassadors, not private citizens, as closer examination of the statutes will reveal. What the statutes did was confer rights and privileges on individuals as though they were natural born. They did not expand the definition of what is "natural born", or change the historical fact of the physical circumstances of their birth. U.S. statutes today may confer the rights and privileges of the natural born on someone, but that does not make them natural born, nor can the privileges extend to eligibility for public office that specifies the candidate be natural born. On one point he gets it profoundly wrong: "...the legal presumption is always of eligibility, and thus the initial burden of proof is always upon those who challenge a candidate's eligibility, and not on a candidate to "prove" eligibility". That contradicts the ancient principle of quo warranto whereby an official always has the burden of proof of his authority or claim to hold office. That duty is not confined to those who already hold office, but extends to those who seek it. Maskell's report is just a legal brief contrived to support the eligibility of John McCain and Barack Obama, two powerful men that no CRS report could, politically, be expected to disqualify. the children of all natural-born subjects, born out of the ligeance of Her Majesty [Queen Anne], her heirs and successors whose fathers were or shall be natural-born subjects of the Crown of England, or of Great Britain, at the time of the birth of such children respectively ... ¦shall be deemed, adjudged and taken to be natural-born subjects of this kingdom, to all intents, constructions and purposes whatsoever. But "deemed, adjudged and taken to be" natural-born subjects does not redefine what is a natural born subject. It only confers the privileges of a natural born subject. It is the meaning of the term that applies to eligibility to office, not a legislative act that grants privileges of such. The argument has been made that many English statutes "redefined" "natural born", and that establishes precedent that the naturalization powers of Parliament, and therefore Congress, included the power to legislatively redefine "natural born", but none of the English statutes did that, and none of the U.S. naturalization statures have attempted to do that. It is also important to recognize that the English Parliament, unlike the U.S. Congress, sits as an ongoing constitutional convention, rewriting its constitution from one act to the next. Therefore legislative practice in the English Parliament is not a precedent for U.S. legislative practice. It is important to understand that by English law, the rights of subjects, natural born British subjects, and natural born subjects in the colonies were not the same. One of the great issues of the American Revolution was over this difference. Subjects born in the American colonies insisted on having the same "rights of Englishmen", but British jurisprudence treated them as having different and lesser rights, so when a British statute asserted that some subjects be "considered as" British natural born subjects, it was doing something of great legal significance to the subject, affecting rights of inheritance, due process, eligibility to elect their own members of Parliament, and hold certain offices, especially military ones. So the phrase "considered as" was significant, even after the colonies asserted their independence. XII. To the above catalogue of those exempted from sharing in the calamities of war, may be added merchants, not only those residing for a time in the enemy's country, but even his natural-born, and regular subjects: artisans too, and all others are included; whose subsistence depends upon cultivating the arts of peace. The truest tacit consent of this kind that is ever observed, is when a foreigner settles in any country, and is beforehand acquainted with the prince, and government, and laws, to which he must submit: yet is his allegiance, though more voluntary, much less expected or depended on, than that of a natural born subject. On the contrary, his native prince still asserts a claim to him. 2d. That His Majesty's liege subjects in these colonies are entitled to all the inherent rights and privileges of his natural born subjects within the kingdom of Great Britain. All persons who by their own oath or affirmation, or by other testimony shall give satisfactory proof to any court of record in this colony that they propose to reside in the same  years at the least and who shall subscribe the fundamental laws, shall be considered as residents and entitled to all the rights of persons natural born. Prior to the adoption of the constitution, the people inhabiting the different states might be divided into two classes: natural born citizens, or those born within the state, and aliens, or such as were born out of it. The first, by their birth-right, became entitled to all the privileges of citizens; the second, were entitled to none, but such as were held out and given by the laws of the respective states prior to their emigration. In the states of Kentucky and Virginia, the privileges of alien friends depended upon the constitution of each state, the acts of their respective legislatures, and the common law; by these they were considered, according to the time of their residence, and their having complied with certain requisitions pointed out by these laws, either as denizens, or naturalized citizens. As denizens, they were placed in a kind of middle state between aliens and natural born citizens; by naturalization, they were put exactly in the same condition that they would have been, if they had been born within the state, except so far as was specially excepted by the laws of each state. Naturalization may be obtained in the state courts, as well as in those of federal jurisdiction; but it can only be done in execution of a Jaw of congress. There are states where aliens cannot hold real property, which often makes it necessary for them to be naturalized, as by that means they become entitled to all the privileges and rights of natural born citizens, except that they cannot be elected to the offices of president and vice-president. 2. He has all the rights of a natural born citizen, except that of being eligible as president or vice-president of the United States. In foreign countries he has a right to be treated as such, and will be so considered even in the country of his birth, at least for most purposes. 1 Bos. & P. 430. See Citizen; Domicil; Inhabitant. 2(15) This principle is in every respect recognized and acted upon by our municipal law. It is in respect of, and as a due return for, the protection every natural born subject is entitled to, and actually does, by law, receive from the instant of his birth that all the obligations of allegiance attach upon him, and from which he cannot by any act of his own emancipate himself. This is the principle upon which is founded the rule "Nemo potest exuere patriam," Calvin's case. 7 Coke 25. Co Lit. 129, a; and see an interesting application of that rule in Macdonald's case, Forster's Crown Law 59. — C.
... it was for reason of the principle of the feudists, as found in the jus soli; by birth on an inanimate piece of land, was created a relation to that land which was immutable. Not alone was the rule applicable to those children whose parents were held in an immutable relation to the piece of land on which they were born, but also, to the children of parents who were or who were not held in an immutable relation to a piece of land in some other country than England. This rule was hedged in by another rule: "Nemo exure potest patriam," which was designed to enforce the rule of the feudists, that man was an immovable and belonged to the piece of inanimate land on which he was born, there to remain and abide, subject to his lord, the king. Are "natural born" and "naturalized" mutually exclusive? Much of the current debate over whether Sen. Ted Cruz is eligible is based on a rejection of the premise that the two terms are mutually exclusive. This debate has devolved into a dispute between those who maintain the premise that "natural born" and "naturalized" are not exclusive, that a naturalization statute that makes one a "citizen at birth" also makes one a "natural born" citizen. A debate without agreement on the logical premises can never be resolved. The basis for that premise is historic legal documents that the two are exclusive. If that premise is not accepted then we get the position that one can be made "natural born" by statute, and the entire meaning of "natural" is that it is not done by humans, but is something that is independent of human agency, as statutes are not. It is important to recognize that "citizenship" itself is man-made. So we need to separate "natural born" from "citizen". The two are independent of one another. Naturalization statutes can make one a citizen, but not "natural born". That is solely about the physical circumstances of one's birth, such as location. It has nothing to do with the citizenship of parents, which can change from one day to another, because such status is man-made. Citizenship is not heritable, because inheritance itself is man-made. It follows from that premise that no statute can make one "natural born", it can make one a citizen, but not a "natural born" citizen. Acquisition of U.S. Citizenship by a Child Born Abroad, U.S. State Department. 1917 Jones-Shafroth Act, made all citizens of Puerto Rico U.S. citizens, although Puerto Rico is not U.S. soil, so its citizens are not "natural born" for eligibility to serve as U.S. president. 1952 Immigration and Nationality Act Title 3 Chapter 1, made child of one U.S. citizen a U.S. citizen. Naturalization statute, creating citizens at birth, but not defining "natural born" citizenship. Immigration and Naturalism Act, Sec. 301(g). Provides for children born abroad to U.S. citizen parents to be naturalized U.S. citizens at birth. Your Government and You Lesson Answer Key, Handbook from U.S. Citizenship and Immigration Services (USCIS). "... to be president or vice president, you must be born in the United States". We’re All Ruth Bader Ginsburg Now, Ann Coulter, Jan. 14, 2016. 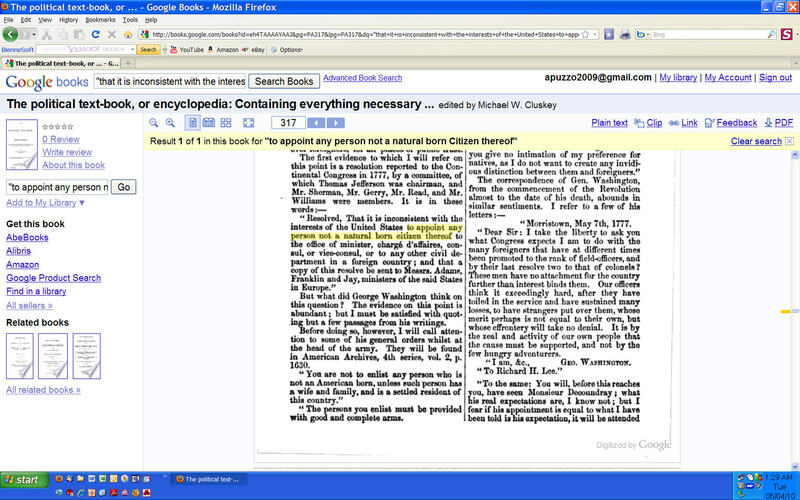 Thomas Jefferson use of term "natural born citizen" in 1777. The Original Meaning of 'Natural Born' by Michael D. Ramsey University of San Diego School of Law January 2016. Under Ted Cruz’s own logic, he’s ineligible for the White House, by Lawrence H. Tribe, Harvard Law School, 2106. Face it, Ted Cruz. You can't be president. by Mary Brigid McManamon, Widener University Delaware Law School. 2016. Claims that Senator Cruz is not “Natural Born" Need to be Taken Seriously, by Rob Natelson; The Originalism Blog — The Blog of the Center for the Study of Constitutional Originalism at the University of San Diego School of Law. On the Meaning of “Natural Born Citizen", by Neal Katyal & Paul Clement, Harvard Law Review, March, 2015. Rejects exclusivity of "naturalized" and "natural born". Presidential Eligibility Tutorial, by Stephen Tonchen, 2014. Makes case for "natural born citizen" to require both birth on the soil and at least one citizen parent. "Natural Law and Birthright Citizen in Calvin's Case (1608)", 9 Yale J.L. & Human. 73 (1997), Polly J. Price. Q&A: Is Ted Cruz eligible to be president? Judicial. The first approach that most people try, concerned that someone not eligible might become president, is to sue in some court. But one would soon discover the limits on the power of courts to grant certain kinds of relief. It wouldn't work to sue for injunction to keep the ineligible candidate off the ballot, because the names that appears on ballots are not the actual candidates in that election, but the members of slates of electors pledged to vote for one of the names on the ballot, or perhaps not. The slate could be the Mickey Mouse slate, pledged to no one. The name is just a label, not necessarily that of an eligible individual. The eligibility qualifications of someone they might vote for is not the eligibility qualifications of the electors. It might be possible to challenge some individual elector candidates under state law, but that is unrelated to the eligibility of the one to whom the elector candidate might be pledged. The listed candidate could be "uncommitted", or even Mickey Mouse. It wouldn't work to sue for an injunction against voters who might vote for an elector pledged to an ineligible individual. The courts have no power to tell voters who to vote for, or not vote for. It would be unlikely to work to sue the secretaries of state of all or most states, in as many separate lawsuits, in their capacity as the counters of the electoral votes cast by the electors in each state, forbidding him to count votes of an ineligible individual. But a court would be loath to try to tell such an official how to do his job, and the window for an injunction would be only a few hours, before which the case would be dismissed as not ripe, and after which dismissed as moot. And while state law might make the secretary of state the primary official responsible for counting and reporting, there is nothing in the U.S. Constitution that prevents him from just turning the job over to the electors themselves, or to some citizen selected at random, none of whom would be subject to the personal jurisdiction of the court. A court would have no jurisdiction to tell electors not to vote for ineligible individuals. Electors may vote for anyone they please, eligible or not. They have no enforceable public duty to vote only for eligible candidates. It would not work to try to sue members of Congress for injunction to compel them not to count the electoral votes for ineligible individuals, because courts don't have the jurisdiction to tell members of Congress how to vote or what to do. It would not vote to sue to forbid anyone from leading an ineligible candidate in taking the presidential oath office, or witnessing it, because the candidate can take the oath by himself, in a public setting that would make witnesses of millions of people. It would not work to sue, perhaps on a writ of quo warranto, to remove him from office, because under the Constitution removal can only be done by Congress following impeachment. No judicial court has jurisdiction to do that. It might help to sue for declaratory relief, in which the judge would give his opinion on whether the individual is eligible, but he would have no power to order anyone to do or not do anything. The opinion might persuade some voters not to vote for an ineligible individual, but there are probably not very many voters who would change their choices based on the opinion of some judge they don't know. About the only way to set up a Supreme Court challenge would be to get some state secretary of state to refuse to certify electoral votes for the ineligible candidate. That would provide standing for the candidate and for opposing parties. Conclusion: Enough votes by voters will trump any constitutional restrictions on eligibility. That is also why ineligible candidates can ignore their lack of eligibility and proceed anyway, unless enough voters take the Constitution seriously, and are informed of these arguments. Political. If no relief is available in the courts, this is what we are left with. Don't vote for ineligible candidates, and persuade enough others not to vote for them. If the contest is close, that might provide the margin of defeat, and persuade the political class to back another candidate that has a better chance to win. Defeat in the next election the officials who counted electoral votes for ineligible individuals. If enough elected officials feel threatened with defeat, they might not count the ineligible electoral votes, again, enough to provide the margin of victory by eligible opponents. Refuse to cooperate with any official actions taken by ineligible officials. This is nullification. Might need to be backed by mass demonstrations to get enough people to do the same. To be "natural born" is to be born on a spot of soil somewhere, and that also makes one a citizen, of jus soli countries like the United States, if that soil is part of the dominion of that country, which in U.S. law is referred to as "incorporated" territory, as distinct from a protectorate, leasehold, or other merely "administered" territory. They are unassimilated indigenes (members of "domestic nations" such as "Indians not taxed", but there no longer are any). In the United States, the citizenship of one or both parents of one natural born to U.S. soil has no effect on whether he is a U.S. citizen, but their activities or agent status may, regardless of citizenship. U.S. soil for the purpose of citizenship means "incorporated territory". That is, territory that is not a protectorate like Puerto Rico or Guam, or a leasehold like the Panama Canal Zone or Guantanamo. That does not include U.S. military bases or the grounds of foreign embassies abroad, but it does include U.S. territorial waters, or the space within U.S. flag vessels on or over international waters or Antarctica. A person born in Arizona, Hawaii, or Alaska before those territories became states would be eligible to serve as president, because it is "incorporation" and not statehood that makes a territory U.S. soil. "Citizen at birth" is not "natural born citizenship". Those are entirely different concepts. Many people are made citizens at birth by statute. That is what the statute did that retroactively made John McCain a U.S. citizen at birth, or the statute that makes persons born in Puerto Rico U.S. citizens at birth, or some provisions of 8 USC 1401, but those are naturalization statutes, and one can be naturalized at birth. It doesn't have to be done after birth, through a congressional "private bill", or through an application process. However, such a naturalization statute could be retroactively repealed, making all persons it naturalized non-citizens. Natural birth on the soil of a country cannot be repealed. It is a fact of history, not the work of legislators. No Supreme Court opinion has "defined" natural born citizenship for purposes of presidential eligibility. The cases cited were either dictum or concerned ordinary citizenship sufficient to vote or hold office, but not to serve as president. The evidence we have of the original meaning of "natural born" citizen (although they used the synonymous term "subject") come from the commentaries of William Blackstone based on a judicial decision, Calvin's Case, of Edward Coke. Vattel is not a correct source against this point, because in the paragraph usually cited he was writing as a Swiss about the rule used in Switzerland and some other countries on the European Continent, jus sanguinis, but as he writes two paragraphs later, the different rule is used in Britain and its colonies, jus soli. The burden of proof of eligibility is on the candidate, not on one challenging eligibility, and he must be presumed to be ineligible unless or until he can produce the proof. The image of the document that has been offered by Obama is clearly fraudulent, no matter who may attest otherwise, because the original image can be viewed in the tool used to produce it, Adobe Illustrator, which shows the separated edit layers that reveal the history of how it was composed using pieces of image from different sources. The Congressional Research Service (CRS) is not a reliable scholarly source. They are like Wikipedia, a place to start but not authoritative. The author of the paper supporting the eligibility of McCain and Obama was working for the CRS, which produces a lot of what historians call "law office history", heavily influenced by the interests of members of Congress. Although one could seek a declaratory judgment from a court, there is no point at which one can get injunctive relief, except in each state at the point presidential electors cast their votes. The only point at which eligibility can be effectively challenged politically is at the point Congress counts the electoral votes, but no court has jurisdiction to tell Congress how to do that. At that point it is up to the members of Congress to voluntarily comply with the Constitution. It does not work to try to exclude an ineligible candidate from the ballot because people are not voting for the candidate, they are voting for electors, and it is only the eligibility of the electors that matters at that point, not the person they are pledged to vote for as electors. Image of alleged Obama Certificate of Live Birth, taken from the White House website on 04/27/2011, which is an obvious forgery. However, even if it were not a forgery, it does not prove Obama was born in Hawaii. Obama Fraudulent Certificate of Live Birth. Analysis and discussion of the image posted. Barack Obama: Original Long Form Birth Certificate. Analysis by Mara Zebest, 06/29/2011. Layer upon layer: Opening Obama's birth certificate in Adobe Illustrator, by Michael Bates on April 27, 2011. Request pursuant to 18 U.S.C. §3332 to inform the grand jury of whether President Barack Obama may have violated Federal criminal law, by Montgomery Blair Sibley, 01/12/2012. 100% Proof Obama's Long Form Birth Certificate is fake, video by Jeff Duff, 04/28/2011. White House Posts PDF of Certificate of Live Birth. Analysis. Proof Obama's 4/27/11 "Long Form Certificate of Birth" is Forged!, video, 04/27/2011. Arpaio: Obama birth certificate is a fraud, U.K. Guardian, 03/01/2012. Arizona sheriff's six-month investigation ends with Arpaio vowing to find whoever 'forged' Barack Obama's birth certificate. Born in the Panama Canal Zone on August 29, 1936, which was a leasehold, not incorporated U.S. soil. Gabriel J. Chin, reported in an article in the New York Times, July 11, 2008, focused on a 1937 law that conferred citizenship on children of American parents born in the Canal Zone after 1904, which made John McCain a citizen just before his first birthday. But the law came too late, Professor Chin argued, to make Mr. McCain a natural-born citizen. However, Chin made the error that citizenship at birth was the same as being natural born. Lawrence B. Solum wrote an article examining the legal history of the issue without coming to a firm conclusion. Michigan Law Review, Vol. 107. Nonbinding resolution of the U.S. Senate declaring, erroneously, that McCain is a "natural-born citizen", proving only that the U.S. Senate is incompetent or corrupt. Sen. Cruz is not eligible to be president, and could only be made eligible in two ways. One would be for at least the small parcel of land in Calgary on which he was born to be ceded to the U.S. and made incorporated territory for the duration of a term as president. It could not just be U.S. soil at the moment he might be inaugurated, but it could remain Canadian soil until that moment, and then be ceded back when his successor is inaugurated. The second would be for the province of Alberta to secede from Canada and be admitted as a state of the U.S. before the term of presidency would begin. The spot doesn't have to be U.S. soil as of the date of birth, only for the duration of the term in office. Rafael Edward “Ted" Cruz was born in Calgary, Alberta, Canada on December 22, 1970 and remained a Canadian citizen until he officially renounced it on May 14, 2014, eighteen months after taking the oath of office as a U.S. Senator. At the time of his birth, Cruz’s father was a citizen of Canada and his mother was a U.S. citizen. “a person born outside the geographical limits of the United States and its outlying possessions of parents one of whom is an alien, and the other a citizen of the United States who, prior to the birth of such person, was physically present in the United States or its outlying possessions for a period or periods totaling not less than ten years, at least five of which were after attaining the age of fourteen years: Provided That any periods of honorable service in the Armed Forces of the United States by such citizen parent may be included in computing the physical presence requirements of this paragraph." First, according to the Canadian Citizenship Act of 1946, also referred to as the “Act of 1947," Canada did not allow dual citizenship in 1970. The parents would have had to choose at that time between U.S. and Canadian citizenship. Ted Cruz did not renounce his Canadian citizenship until 2014. Was that the choice originally made?